The Shopper's Guide to Pesticides is a key resource for consumers looking for healthier low toxin diets. 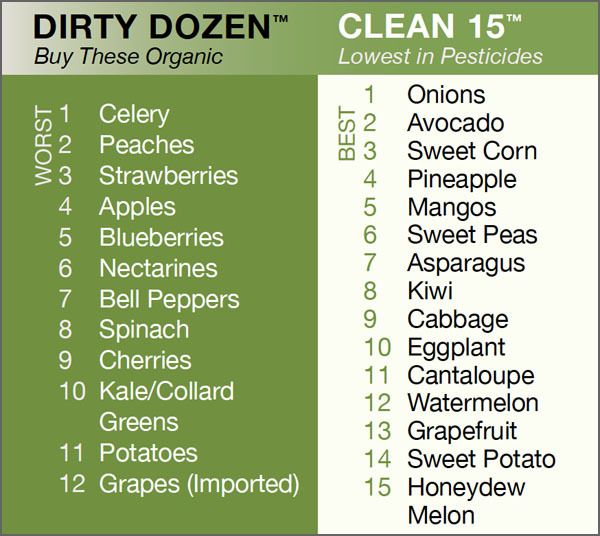 Since many shoppers can't always find or afford organic produce, they can use the Shopper's Guide to avoid those conventional fruits and vegetables found to be highest in pesticides - the Dirty Dozen - and, instead, choose items from the Clean Fifteen list. The health benefits of a diet rich in fruits and vegetables outweigh the risks of pesticide exposure. Use the Environmental Working Group's Shopper's Guide to Pesticides to reduce your exposure as much as possible, because eating conventionally-grown produce is far better than not eating fruits and vegetables at all. The Shopper's Guide will help you determine which fruits and vegetables have the most pesticide residues and so are the most important to buy organic. You can lower your pesticide consumption by nearly four-fifths by avoiding the 12 most contaminated fruits and vegetables and instead eating the least contaminated produce, according to EWG calculations.